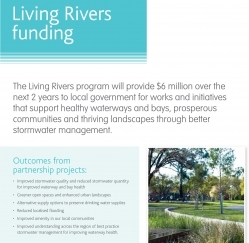 Round three of the Living Rivers program will provide $2.86 million over this financial year to local government for integrated water management works and initiatives. These will support healthy waterways and bays, prosperous communities and thriving landscapes through improved stormwater management. This is a fantastic opportunity for Councils within Melbourne Water's boundaries to apply for the funding. Applications for round three funding open 22 September 2015 and will close on 19 October 2015. More information will be available shortly on Melbourne Water's Living Rivers website.